LAPD run out of Chicano neighborhood | Fight Back! 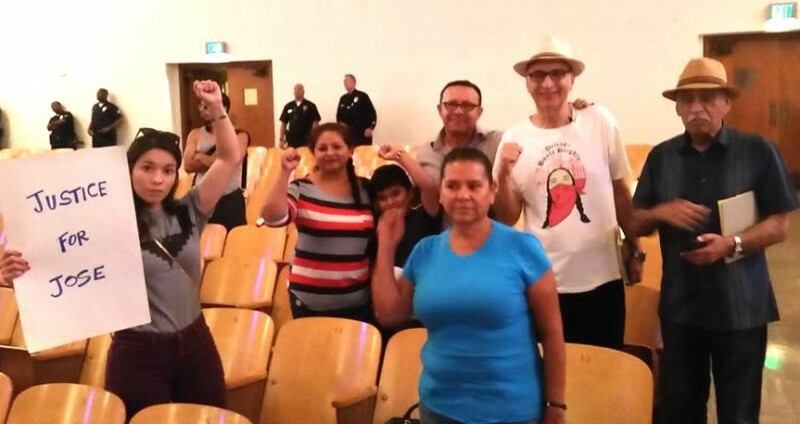 Los Angeles, CA - Facing intense pressure from the community, the Police Commission and Chief Beck fled a June 21 ‘community’ meeting.’ They could not take the heat and left out the back doors. Chief of LAPD Charlie Beck, Police Commission members Kathleen Kim, Robert Saltzman, Sandra Figueroa-Villa, Steve Soboroff and Matt Johnson, along with over 25 police officers, gathered at Hollenbeck Middle School. The neighborhood of Boyle Heights, home to Hollenbeck Middle School, was the site for the first community meeting of the LAPD Police Commission to hear from the residents. 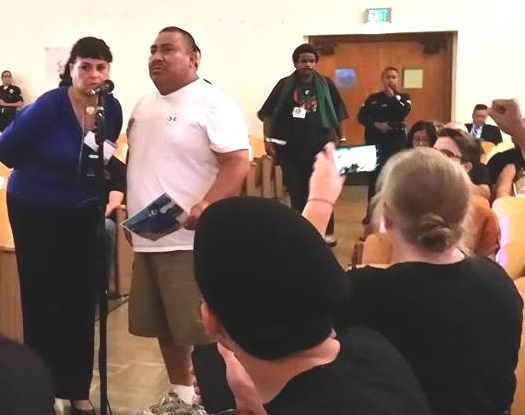 Black Lives Matter, the Stop LAPD Spying Coalition, and Centro CSO met the LAPD meeting with much resistance. Bringing three families of LAPD police killings and shootings, and one victim family of LA Sheriff killings, Centro CSO was able to directly confront Chief Beck and the other LAPD officers present. The family of a 16-year- old Chicano, Jose “Peruzzi” Mendez, killed Feb. 6 by LAPD; the family of Arturo Y Torrez killed by LAPD April 10; the family of Edwin Rodriguez killed by ELA Sheriffs Feb. 14, and Maria Banda, whose son was shot by LAPD in Boyle Heights and left for dead, only to be currently imprisoned, were all present and spoke out. “I should not be expected to believe the men who killed my son, Arturo Y Torrez,” shouted Blanca Duran. Three of the four families were Spanish-speaking only. LAPD speakers exceeded the two-minute comment limit, but whenever a Spanish-speaker would take the mic along with a translator, the buzzer would go off and the cops would insist on the speakers leaving the mic. The public immediately protested, shouting “Four minutes now!” until finally Spanish-speakers were given four minutes, a fairer amount of time to comment. Black Lives Matter rose in solidarity with the families and held a moment of silence to commemorate the lives taken by LAPD in Boyle Heights, and the greater Los Angeles area. At one point, they projected a video captured earlier that same morning of LAPD using excessive force against a senior citizen Black man who had exceeded his two minutes of public comments.